1 child is dead after 7 were found unconscious in and near the indoor-pool area. One child is dead and six other children are hospitalized for apparent carbon-monoxide poisoning after they were found unconscious inside and around the indoor-pool area of a Michigan hotel on Saturday. The carbon-monoxide leak was caused by a broken pool heater, according to the Niles Police Department. Fire Department Capt. Don Wise in Niles, Michigan, told reporters that staff at the local Quality Inn and Suites found six children laying on the pool deck unresponsive and unconscious on Saturday. The staff members immediately opened the doors to the indoor-pool area and called 911, he said. Wise said it's unclear how long the children, who range in age from about 12 to 14, were unconscious before they were found. (ABC News) Officials said the children were found unconscious and unresponsive in the indoor-pool area of a Niles, Michigan, hotel. First responders arrived on scene and evacuated the children, who were taken to area hospitals. "When we first went in with our [air] monitors, the monitors went off," Wise said. "All the responders took a little bit more risk, but we had to get those kids out of there and into fresh air for their best chance at survival." First responders then went through each floor of the hotel to evacuate any remaining visitors and staff, according to the Niles Police Department. 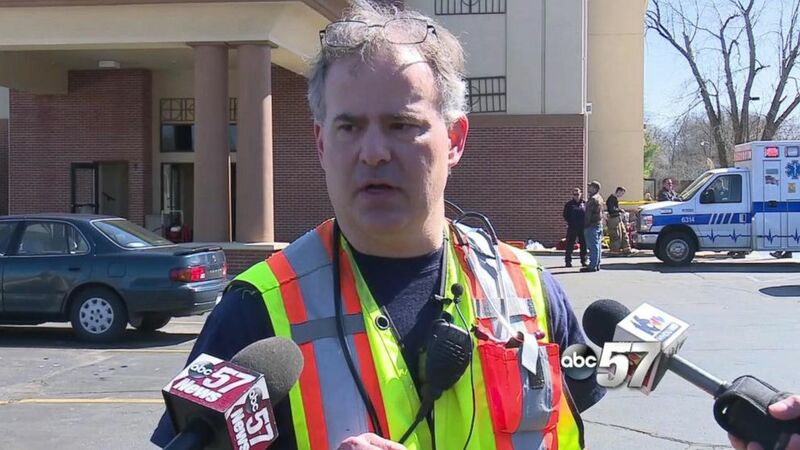 During the room-to-room evacuation, a family member of the children alerted first responders to a seventh child in one of the first floor rooms who wasn't breathing. She had just come from the pool area where she had been with the other six children. Responding officers were able to get the girl to respond to them and she was able to walk outside to an ambulance, police said. Quality Inn confirmed to ABC News that the entire hotel was evacuated. According to police, the hotel had approximately 24 rooms booked at the time of the incident and all guests and staff were evacuated from the building. The hotel has been closed for occupancy while the investigation continues, police said. A total of 15 people were transported from the scene to two area hospitals, including six adults and nine children. One of the children was dead on arrival at Lakeland Hospital in Niles, hospital spokesperson told ABC News. Police have identified the child as 13-year-old Bryan Douglas Watts. Lakeland Hospital in Niles is treating a hotel employee housekeeper. Two Niles Police Department officers and two Berrien County deputies have been released, the hospital spokesperson told ABC News. Memorial Hospital of South Bend in Indiana, some 10 miles from the hotel in the southern Michigan city of Niles, is currently treating nine patients -- eight children and one adult. Two of the children are in serious condition and five are listed as fair. One child has been treated and released, a hospital spokesperson told ABC News. 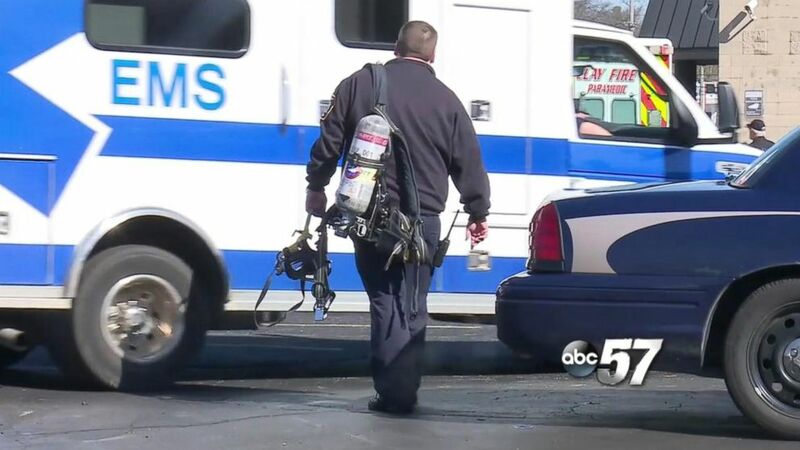 The adult patient at Memorial Hospital of South Bend has been released. The patient is a police officer who helped rescue the unconscious children, the hospital spokesperson said. The fire captain said the highest carbon monoxide reading he saw in the pool area was 800 parts per million, far above the 50 ppm maximum that the U.S. Occupational Safety and Health Administration recommends for workplace exposure eight hours per day, five days per week for a normal, healthy adult. "That’s an extreme danger level," Wise told reporters. "At those levels, they don’t have much time before they're going to go unresponsive." Officials detected higher-than-normal carbon monoxide levels in other areas of the hotel, but not as dangerous as the level detected in the pool area, Wise said. It's unclear if there is a carbon monoxide detector in the hotel's pool area. ABC News' Hallie Eisenpress contributed to this report.